The upload folder is now full - says the site - denying me sharing my photos that are pertinent to a post...put the old stuff into a death panel, admins! Michael, thanks for pointing out the upload folder problem. Don't you have a Flickr account? They are tied with Yahoo now, which should make it even easier. The upload storage in the forum is meant to be transient. When did you notice the change in the gallery? We haven't made any changes since the patch applications months ago. Michael, I'll clean out the old attachments, and look into the Exif data. I noticed it on a few shots as well, but if the shot doesn't have the exif data, it doesn't display it, so I didn't think too much of it. You also have to keep in mind that some lower end editing programs will strip this information, such as older versions of paint shop pro. Hope to see you this weekend. 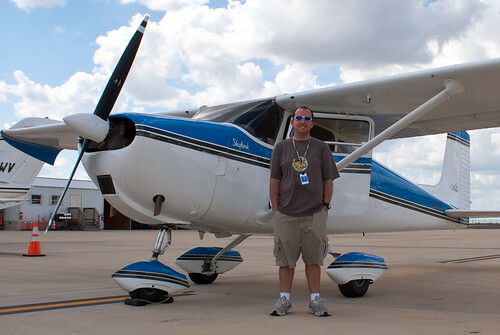 Just look for this white & blue Cessna, along with the dork next to it at Wings over Houston!